It's been about 10 days since I wrote an update on the Phoenix Abyss hyper-rush game. The game is at day 35 or thereabouts and coming along quite nicely. 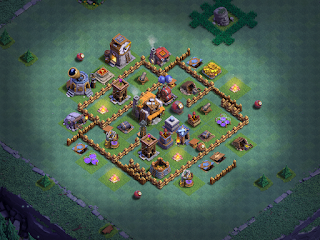 All defenses - except the Roaster (L1) and MultiMortar (L2) - are now at level 3 or level 4. FireCrackers are at level 4 and I'm working on the Cannons first then Archer Towers next. The Battle Log is looking pretty good; 7 out of the last 10 attacks are wins (it was 8 out of 10 until I ran an attack a little bit ago that went belly up). Trophies have advanced well also; I'm hovering around 2400 cups which is 315K or so in daily loot. Beta Minions are at level 10 with level 11 just around the corner. I anticipate having level 12 done in the next few days and that will put our attacks on par with many (most?) early BH6 offenses. Battle Machine is still level 1, of course, but that hasn't been hurting the game very much so far. The Mass Beta Minion attack strategy is serving me well. In any given day, I hit the loot cap within 3 or 4 attacks and I'm getting a lot of 2-star wins in the middle percentages (55%-65%) with an occasional 3-star even. I continue to run a variation of the Shrouded Diamond base. This base is nice because it has solid air defenses at the top, and a mixed defense at the bottom that adds high HP structures to keep either air or ground troops busy while the defenses take them out. This is one of the 14 BH6 Base Designs that I discussed in a previous article. I keep two others in case the meta should be unfavorable on any given day but, thus far, no complaints. BH6 without at least a level 5 Battle Machine is a bit daunting. We're still winning and not doing too badly, but it has its moments of frustration. I'm seeing the same on my other BH6 games that have a level 1 Battle Machine; lots of structures left with just a sliver of health (especially the BH) leading to losses or close call wins. Likewise, hitting BH6 so early with premie defenses and troops has been difficult. A little perseverance, a little luck...the game is doing pretty darn good. I think I still prefer a slower rush, taking a little more time at each level to develop a couple more troops and strengthen defenses, but if your goal is to get to the end-game as fast as possible and you don't mind a little frustration along the way...the hyper-rush may be your answer. Today's article has a companion video on YouTube - the link is HERE and below. I'd appreciate anyone going there to hit Like and Subscribe, helping me to build the channel. Until next time...thanks for taking the time to read/watch and I hope you've found something useful here!